One of our latest mold removal and remediation jobs in Wisconsin was to help a homeowner who is planning to sell their home. 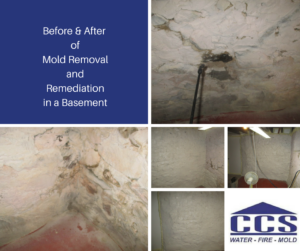 The homeowner wanted to have the mold removed and remediated before the home went on the market. In this case, the property had some minor mold issues in the basement. Keep these tips in mind to keep mold from growing in your basement. De-cluttering in a basement is also a way to remove sources for mold. Mold growth happens when there is a moisture issue along with a source for mold to grow on. This can include paper, card board boxes, fabric, dust and other organic material. If you need help with a mold issue at your property, please call CCS Property Services at 920.435.2288. Our mold removal and remediation job experts will get your property back to pre-mold conditions.